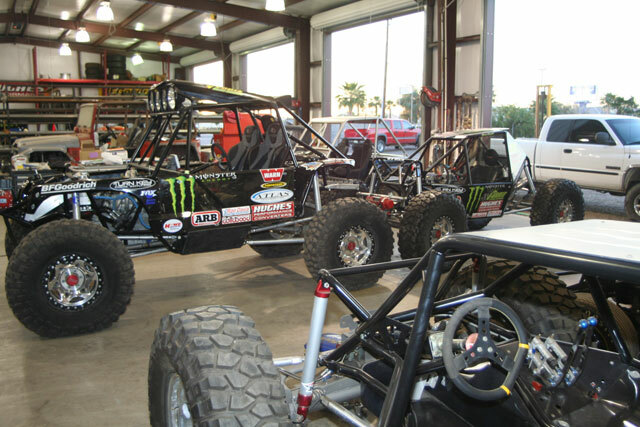 We're here in sunny Gilbert, AZ for the buildup of a serious buggy. A rig that is being built to excel in all areas. From the top echelon of competitive rock crawling in the W.E. 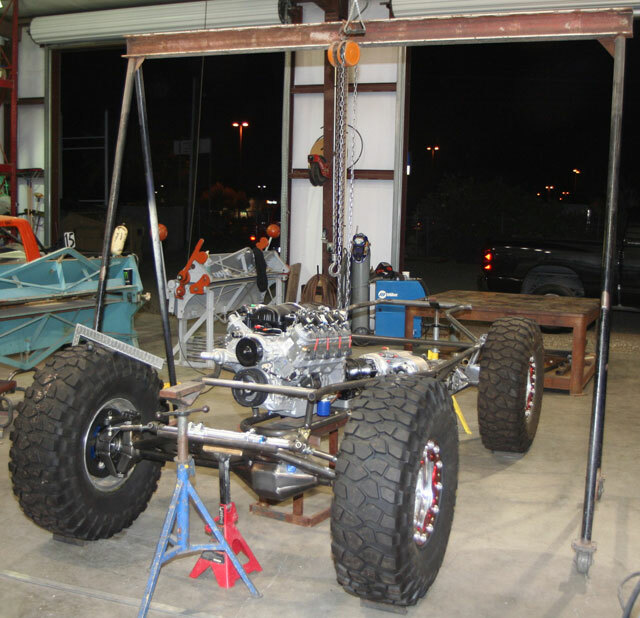 Rock Pro Modified class, to racing in events like "King of the Hammers" to running the Rubicon Trail, this rig is being built to do it all in style. Did I mention we are going to build it in a week? The guys have been hard at work since yesterday, and it shows. The motor is already mounted to some tubing. More coming very soon as I sort through the pictures Jason has already taken. The webcam didn't survive the flight from CA to AZ. It's not operating, so we will have to do photo updates today, and maybe I can find another webcam locally. 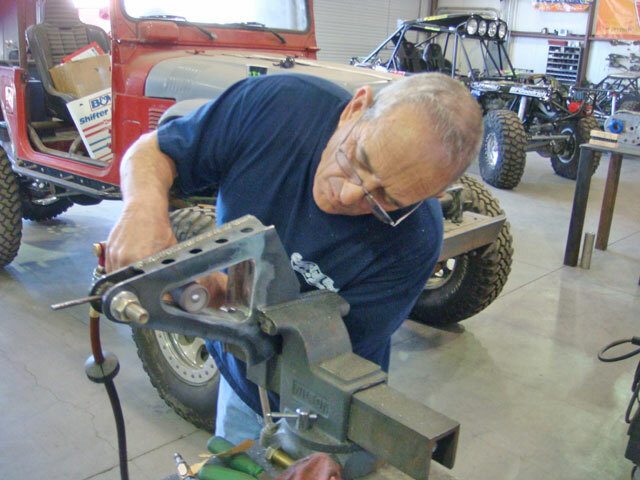 Don and Kitchell carefully line up the panhard bar mount, and tack it into place. 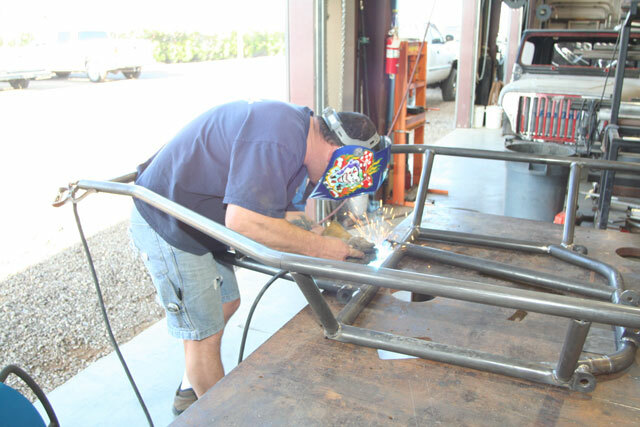 Nick pulls out the motor so he can weld up the motor mounts and front part of the chassis. 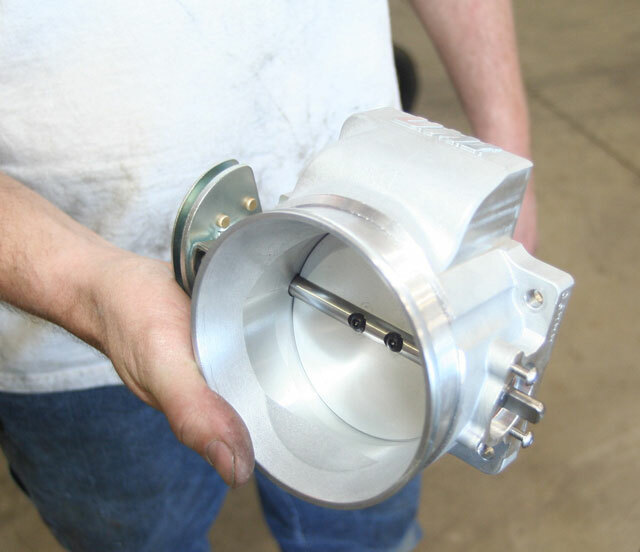 Since the LS7 is drive-by-wire, the throttle body had to be replaced with this massive 3.5" unit UMI. 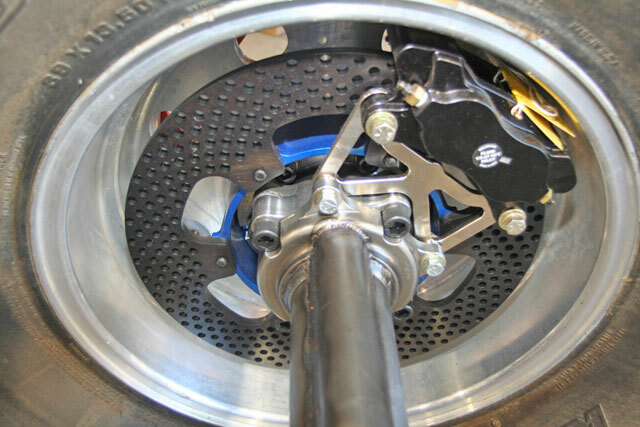 A shot of the massive 14" Spidertrax brakes. The motor got dropped back in the mounts, and now it's time to mock it up between the wheels! It's starting to look like a rig already! In the picture below, Shannon has mocked up lines with grids on the floor. 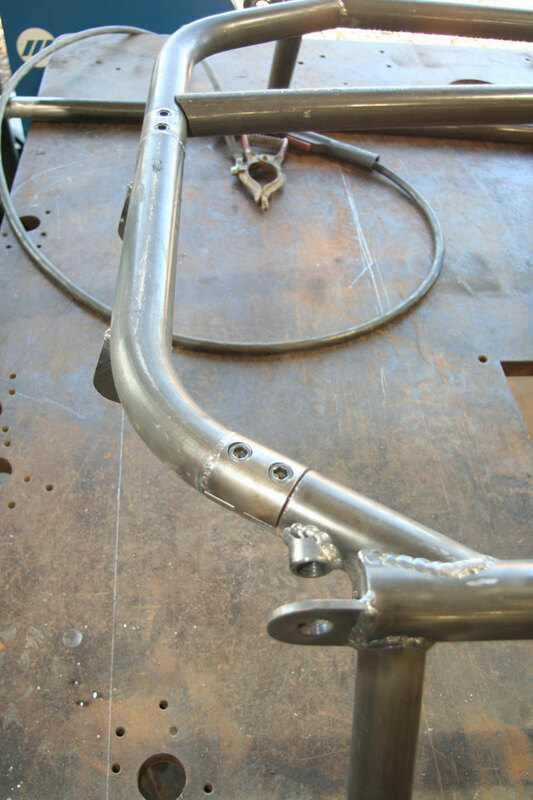 He is squaring the axles and chassis so that they can begin the suspension links. Video is coming of Shannon explaining how he is doing this mockup. And a quick look around the shop reveals many many Monsters!!! 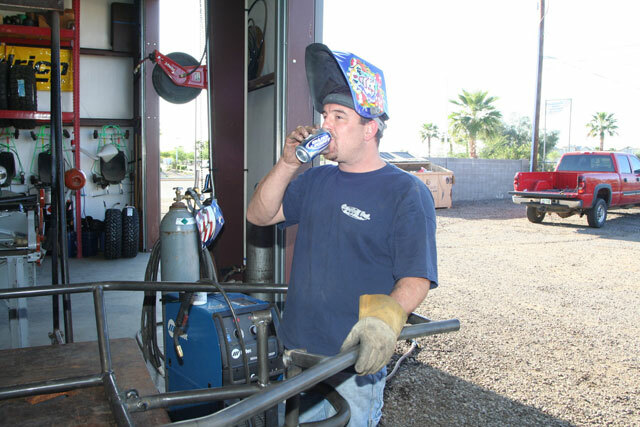 Check out the following video clip of Shannon explaining how he mocks up the rig. It's almost dinner time! 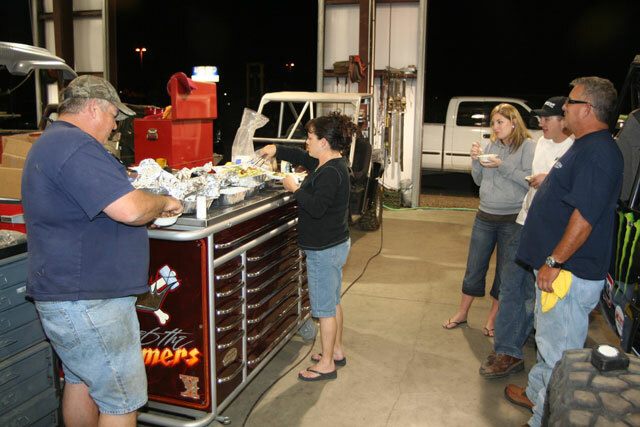 One thing is for sure, when you're hanging out at Campbell Enterprises, you don't EVER go hungry!!! Another picture of the rig on being lined up and quadruple measured. 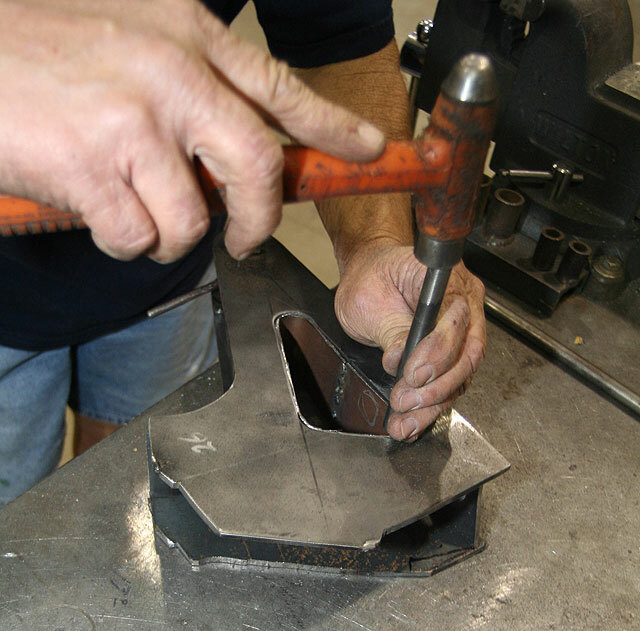 Don is carefully manipulating the metal inside this panhard mount. 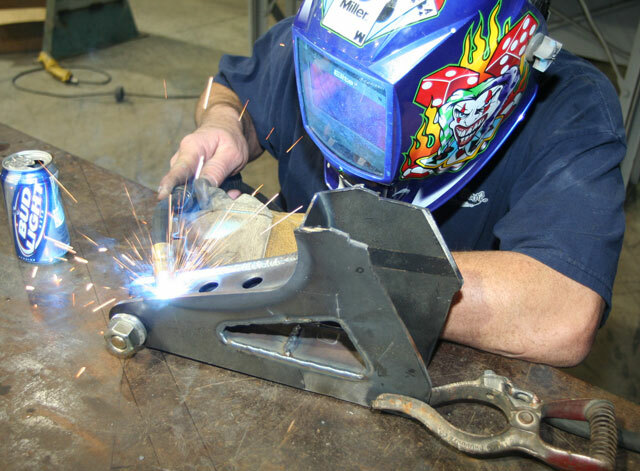 He's tapping it into place before he tack welds it for fitment. With full bellys and a few beers, progress has slowed down. Shannon and Camo discuss the game plan for tonight and tomorrow in this 2.5 minute video. 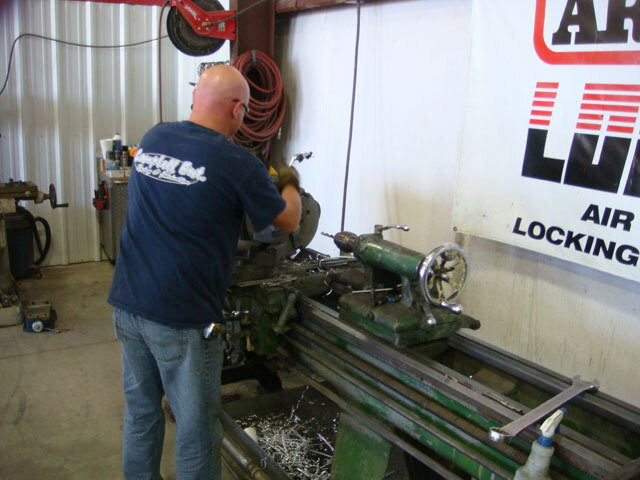 Nick fires up the lathe to make some cool caps/ends for the front stinger.